Rihanna recalled reading Angelou’s memoir I Know Why the Caged Bird Sings as a teenager. “She made us feel so safe, safe enough to trust her wisdom! Wisdom one can usually only acquire through experience!” Ri Ri tweeted. Common, who worked with Maya on his song “The Dreamer,” called her his hero. “I was thinking about her lately. GOD Bless the Soul of one of my heroes. Dr Maya Angelou,” he tweeted. 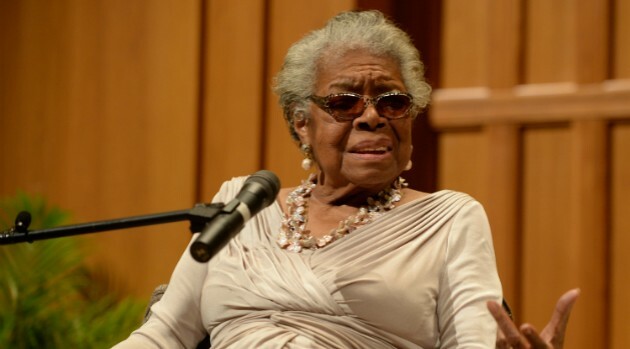 Pharrell Williams wrote: Saddened by the news of Maya Angelou’s passing. A brilliant woman who contributed so much to the world. Her light will be sorely missed. Solange wrote: Your words will forever remain deep within the skin, and in the souls of many. Nas wrote: Momentarily took the air out of me hearing you passed over. Then I smiled for you. REST IN GLORY MAYA ANGELOU. Luv! K. Michelle wrote: Such a leader and beautiful spirit. Thank you! Q-Tip wrote: Wow RIP To 1 of my big inspirations and to one of the worlds sharpest, most beautiful minds. Talib Kweli wrote: Absolutely heartbroken. We love you Maya. Rest in power Queen.